“The finance secretariat advised in a prepared statement that prices now in effect — the December prices plus 1.9% — would be maintained throughout the year. The news release also confirmed that the new prices are actually maximums — individual Pemex franchises will have the freedom to adjust their prices downwards to be more competitive if they wish. Liquid propane also went up 1.9% yesterday, and that price as well will not be subject to any change in 2015. Finance officials also made it clear that the price hike is less than the anticipated rate of inflation — 3% to 4% — for the coming year, thereby reducing the cost of fuel in real terms. How to stave off a revolution as long as oil prices are plummeting. Mexican gasoline is approximately $3.50 a gallon. Texas is now $2.50. What a hell of a deal not increasing the price this year. About 35% of Mexico’s government spending comes from PEMEX. If the price stays at $40 for a couple of years, look out below. Not cool with production down 30% and the price halved since Calderon. And, no increase in production in sight with oil in the 40’s. However, there is one way to bail out this short fall, devaluation. Remember Lopez Portillo? Sorry to hear gas prices are so high ($2.50) in Texas. Colorado’s prices were between $1.55 and $1.73 a gallon when we bought gas in Fort Collins and Loveland this past week. Why do you think that Texas oil/gas men are charging 60% more per gallon than Colorado folks? Some sort of price gouging by the Texas big boys? The Mexican government has set their government spending to match $79 a barrel for oil, so Mexico had big oil $$ surpluses/gains since 2007. – with a peak of $1.7 Trillion of annual US deficit Bush/Cheney bailout and Iraq/Afgan war spending . => Bush/Cheney conservative big deficit policies keeping the MXN peso strong. Now that we’ve had our US deficit down at 3X lower levels ( $0.5 Trillion ) a year, the US Dollar has strengthened – and confidence in the US economy is the best in the world – stronger than Europe/Germany or Japan or China. My buddies in the Texas oil patch are saying that most Texas oil barons are losing money at any price below $60 a barrel – as proven by the Texas oil companies cutting back their contracts and business with oil-field trucking and other oil-field support industries this past month. Oil industry and financial facts point to oil prices rebounding once US oil productions falls – which means prices may not fall much further. As you’re finding with the 60% higher gas prices in Texas (higher than other places) – the Texas oil industry big-wigs do not like small or no profits – and Texas is already cutting services, cutting spending, and they plan even deeper cuts if oil prices stay low. As Texas, North Dakota, and Montana cut back, should we really expect oil prices to fall – or to even stay low? “).- El precio de la mezcla mexicana de petróleo rompió el piso de los 40 dólares al cotizarse este día en 39.94 dólares por barril (dpb), de acuerdo con información de Petróleos Mexicanos (Pemex).” Proceso today. Regarding the price in Texas, I am in Merida and $2.50 is the high in Texas from the Web, some places are as low as $1.70. There are a number of reasons the rebound might be slower than one might think. 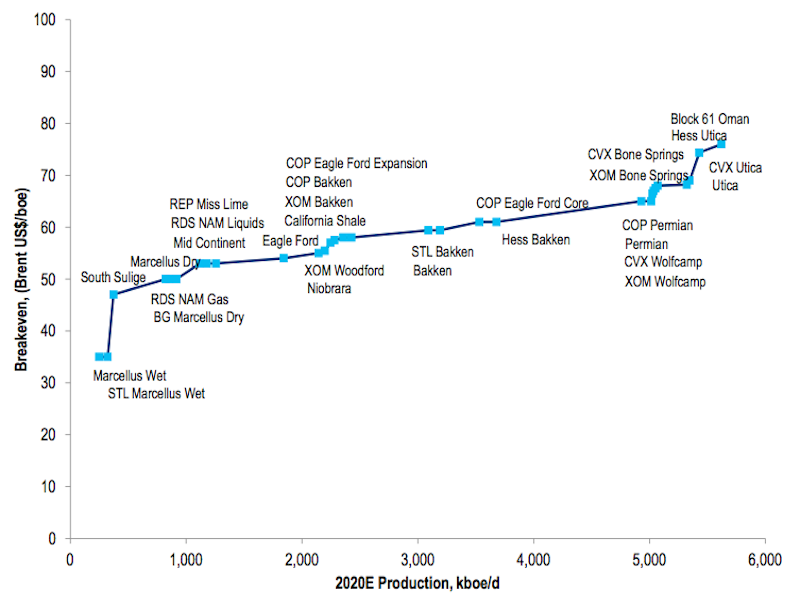 First, the shale people will produce more in 2015 than 2014 because projects are already set. Second, there is likely to be more loss of demand, an important part of the drop, with weakness in Asia and certainly Europe and Latin America. Third, the weak countries will produce more to make up for the loss in revenue. Forth, most people appear to think a rebound is a sure thing and the consensus is usually wrong. But, obviously, no one can know for sure what will happen. Have you seen the latest US oil industry reports and graphs that show their average break-even costs are on average at $60 a bbl, which means most US oil producers are losing money? That’s why they are talking about 30% production cuts by sometime in February. 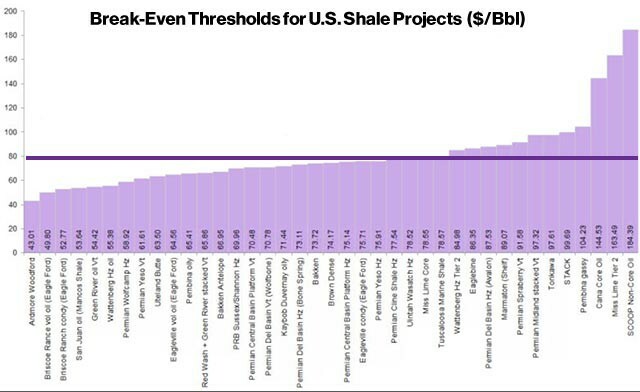 This plot comes from Bloomberg – confirming the $60 bbl US break even prices. All the best wishes for a prosperous New Year! Did you see that the US/Mexican benchmark for crude, NYMEX, closed at just below $48 today. We’re all enjoying the low gas prices! What is price of diesel? Renting a van that is diesel for vacation.